A very brief look at the Aqaba Railway Corporation during a half day stopover in Aqaba, Jordan on January 4th 2013. 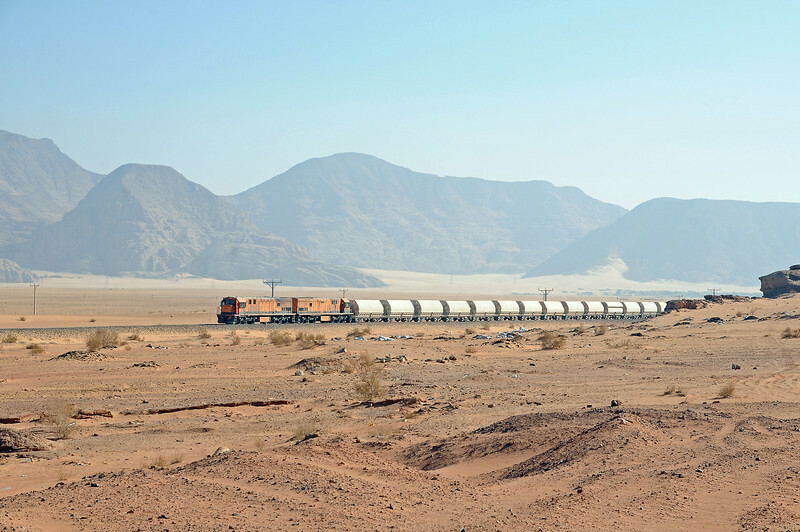 The ARC is a relatively new railway, a 60 mile extension from a junction with the mainline of the Hejaz Railway at Batn al Ghul to carry phosphates, Jordan's only natural resource, to the port-resort of Aqaba for export. It was laid to the Hejaz Railway's unique 1.05m gauge. Today about five round trips run each day from a number of mines in and around Ma'an to Aqaba. I was lucky on Friday to see both a loaded train arrive and empties depart. It warrants a return visit. We spent Thursday night in a desert camp in Wadi Rum (where Lawrence of Arabia was filmed). After a morning ride on a camel it was off to Aqaba. As luck would have it we passed a loaded train bound for Aqaba at Disi.